Forget the politicians and their often broken pledges not to raise your taxes! Here’s a pledge TO them FROM you. If you are fed up with the politicians at all levels of government and their abusive spending and overburdening taxation, if you are willing to fight for future generations instead of plundering them, and if you are made of the same steel as your ancestors who fought for freedom and limited government, then sign the pledge below that you will not vote for any politician who votes, or who promises to vote, to raise taxes. To constantly remind them of your pledge and where you stand on taxes, we will send you a RAISE MY TAXES, LOSE MY VOTE bumper sticker. Please note that your information will never be sold or shared with other parties. When you give us your e-mail address, we will send you occasional updates about this campaign and about tax and spending issues in Virginia and Washington. Read more about RAISE MY TAXES, LOSE MY VOTE on our homepage. I will not vote for any politician who votes, or who promises to vote, to raise taxes. What is the Tuesday Morning Group coalition? Tertium Quids, a nonpartisan organization that promotes legislation to create smaller government, freer markets, and greater liberty in Virginia, invites you to join the Tuesday Morning Group, our coalition of conservative and libertarian activists and officeholders. We share information, network, and otherwise collaborate to reduce the role, scope, and cost of government; protect private property rights; and improve K-12 and higher education in Virginia. We REPEALED the state death tax, PASSED a constitutional amendment preventing Kelo-like government confiscation of private property, PASSED a law putting Virginia’s budget online, STOPPED an unnecessary tax hike for transportation, and much more! But we need more activists to make our influence on Richmond even stronger. There is no membership fee. TMG members are people whose allegiance is to principles not party politics. While many members participate in the party process, we understand that free markets, free people, and the first principles of our Founding Fathers are what made our commonwealth and nation unique. By returning to those principles, we will not only be able to overcome the current challenges we face, but also return to our previous status of "a shining city upon a hill" for the rest of the world. If you agree, please join us in promoting these ideals in our government. you will have NETWORKING OPPORTUNITIES with activists and politicians from throughout the commonwealth -- share ideas and get to know political movers and shakers. CALL OR E-MAIL your state legislators when you receive alerts from us. 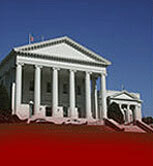 Your voice is needed to promote small government/free market bills in Richmond. You can help us unite the citizens of Virginia who want to limit the size and reach of government, and checkmate those special interests who constantly work to expand the role and power of politicians and unelected bureaucrats. Please also sign me up as a member of Virginia’s largest and most successful coalition of small government, free market activists and organizations, the Tuesday Morning Group coalition.